The automotive industry in North Korea is a branch of the national economy, with much-lower production than that in South Korea. North Korean motor vehicle production is geared towards the Korean People's Army, industrial and construction goals; there is little car ownership by private citizens. In addition to cars and trucks, North Korea produces buses, trolleybuses and trams. The Democratic People's Republic of Korea (DPRK) is not involved with the Organisation Internationale des Constructeurs d'Automobiles (OICA) or any other United Nations industrial committee, so information about its motor vehicle industry is limited. The OICA does not publicize figures for automobile production in the DPRK. As reported by a limited number of observers with first-hand knowledge, North Korea has the capability to produce 40,000 to 50,000 vehicles a year; however, within the past few years only a few thousand vehicles have been produced due to its ongoing economic crisis and recent sanctions. The North Korean automobile industry had its origins during the Soviet era, and the DPRK began motor-vehicle production with licenses obtained from the USSR. The Soviet Union provided assistance in building automotive plants in the country, which were then equipped with technology developed by the Soviet Union. 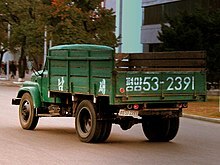 North Korea's first domestically produced automobiles were copies of Soviet designs, such as the GAZ-51 midi-truck, GAZ 69 off-road four-wheel drive vehicle and the GAZ-M20 Pobeda passenger car. Since 1950, Sungri Motor Plant in Tokchon has been North Korea's first and largest motor vehicle plant producing urban and off-road passenger cars; small, midi- and heavy cargo, haulage, construction and off-road trucks and buses under the names Sungri, Jaju and others. 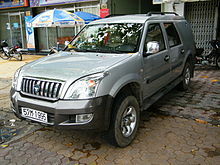 It was the most capable plant of the North Korean automotive industry before being surpassed by Pyeonghwa Motors. All models are reported to be replicas or derivations of foreign cars. Vehicles are generally for civilian and commercial use, as government officials favour foreign imports and the armed forces have their own facilities. The Sungri Motor Plant was founded in November 1950 as the Tokchon Motor Plant (덕천자동차공장). It produced its first vehicle, a Sungri-58 truck, in 1958. In 1975, the plant was renamed Sungri Motor Plant (sungri meaning victory in Korean). In 1980, annual production was reported by the government to be 20,000 units per year, however the rate was more likely between 6,000 and 7,000 units per year. In 1996 production was crippled due to the country's economic difficulties, with approximately 150 units produced. The Sungri ZR 5000 Giant Dumping Truck, is powered by a W shaped 4 cylinder engine producing 1000 hp, and a claimed speed of 200 km/h. Founded in 2000, Pyeonghwa Motors in Nampo is an auto manufacturing and retailing joint venture between South Korea's Pyeonghwa Motors (owned by Sun Myung Moon's Unification Church) and the North Korea's Ryonbong General Corp. Pyeonghwa Motors products are sold under the names Kia, Bbeokgugi (Peokkugi) and Zunma: small and luxury cars, minivans, SUVs and pick-up trucks under license. Pyeonghwa has the exclusive rights to car production, purchase, and sale of used cars in North Korea. However, most North Koreans are unable to drive a car. Because of the very small market for cars in the country, Pyeonghwa's output is reportedly very low. In 2003, only 314 cars were produced even though the factory had the facilities to produce up to 10,000 cars a year. Erik van Ingen Schenau, author of the book Automobiles Made in North Korea, has estimated the company's total production in 2005 at not more than around 400 units. In summer 2006, the North Korean government magazine Foreign Trade, which advertises North Korean products, published a photograph of a new luxury car produced by Pyeonghwa, which appears to be a rebadged version of the South Korean SsangYong Chairman. The Chairman bears a strong resemblance to Mercedes-Benz cars, which are favored by North Korean government officials, and is indeed based on an old Mercedes E-Class design. In 2006, Pyeonghwa reached an agreement with Chinese manufacturer Brilliance China Auto to assemble its Jinbei Haise vans, which are based on a three wheeled version of the 1975 Toyota Hiace. In 2009, Pyeonghwa announced a profit on its North Korean operations. The Pregio and Pronto are also sold in Vietnam by Mekong Auto. Both are based on Hyundai vehicles. Mekong Auto has sold Fiat cars in Vietnam since 1995, and this relationship may have led to Pyeonghwa assembling Fiats in North Korea. Since 1968, Pyongchang Auto Works in Pyongsang took over Sungri Motor Plant's production of Kaengsaeng and Kaengsaeng NA models: a modified Sungri-4.10 4x4 car (the GAZ 69-Jeep combination) and a modified Sungri-4.25 4x4 pickup. During the 1970s, it also began production of Taebaeksan and Tujaeng light aircraft. Since 1974, the Chongjin Bus Works has produced the Jipsam 74, Chongnyonjunwi and Chongjin trolleybus, the Jipsam 86 motorised trolley and the Pyongyang 9.25 and Jipsam 86 and 88 buses. Since 1961, Pyongyang Trolleybus Works has produced Chollima 1, 2, 9.11, 9.25, 70, 72, 74 and 84, Chongnyon, Chongnyonjunwi, Ikarus 260T, Ikarus IK187, and Chollima 032 trolleybuses; the Chollima 962, 90/903, Ikarus 280T and Sonyon articulated trolleybuses, Pyongyang 9.25 buses, Kwangboksonyon articulated buses and Chollima mini-buses. ^ Kim, Mi-young (2002-02-05). "The Struggling North Korean Automobile Industry". The Chosun Ilbo. Archived from the original on 5 December 2002. ^ a b Hoare, James E. (2012). Historical Dictionary of the Democratic People's Republic of Korea. Lanham, Maryland: Scarecrow Press. ISBN 978-0810879874. ^ "The Chosun Ilbo (English Edition): Daily News from Korea". Retrieved 4 September 2016. ^ "China Car Forums - View Single Post - Pyeonghwa Motors (DPRK) and Mekong (Vietnam)". Retrieved 4 September 2016. ^ "Ssangyong Chairman Limousine 4d". Global Auto Index. Archived from the original on 2008-03-11. Retrieved 4 September 2016. ^ "Google Translate". Retrieved 4 September 2016. ^ "Pyeonghwa Motors (DPRK) and Mekong (Vietnam) - China Car Forums". Retrieved 4 September 2016. ^ Mekong. "Mekong - Tin tức". Retrieved 4 September 2016. Automobiles Made in North Korea. China Motor Vehicle Documentation Centre, Seventh edition: February 2010. Photos of vehicles made in North Korea compiled by Erik van Ingen Schenau, author of Automobiles Made in North Korea. ^ China Motor Vehicle Documentation Centre (2006). Automobiles Made in North Korea. Retrieved 29 December 2016. This page was last edited on 20 September 2018, at 21:03 (UTC).